$11.816 million on 3014 screens. 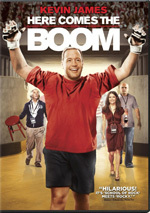 While one might expect nothing but broad slapstick from a film in which Kevin James becomes a mixed martial artist, 2012’s Here Comes the Boom encompasses a more inspirational approach. Scott Voss (James) works as a science teacher at Wilkinson High School, a struggling, run-down facility. Scott used to be a lively, effective instructor, but now he just seems to be punching the clock. Due to cutbacks, the school eliminates the music program – along with the job of veteran instructor Marty Streb (Henry Winkler). This upsets Scott, who suspects tyrannical Principal Betcher (Greg Germann) dumped the program to invalidate Marty’s tenure. In a moment of bravado, Scott promises to raise the $48,000 needed to preserve the music program. Once the moment passes, however, Scott finds himself at a loss in terms of methods that will produce the necessary funds. Scott wants to bail but fellow teacher Bella Flores (Salma Hayek) – a babe he’s been hitting on for years – pushes him to follow through on attempts to save Marty’s job. Eventually Scott comes up with an idea. A former college wrestler, Scott sees that amateur mixed martial artists can earn pretty good money. Despite his age and pudgy physique, Scott embarks on a quest to succeed in the ring and earn the needed money. Like I alluded at the start, anyone who goes into Boom with expectations of a broad, wacky physical comedy can be forgiven. Bankrolled by Adam Sandler’s production company, one could anticipate slapstick nuttiness from a flick in which heavyset, middle-aged James gets involved in MMA. And some of that sort of material does appear, such as when Scott vomits on a defeated opponent. Nonetheless, there’s not nearly as much as anticipated/feared, as the flick really does go more for the “underdog beats the odds” theme than the “fat slob gets the crap kicked out of him” notion. While events don’t get played for much realism, at least they lack the over the top nuttiness I figured we’d get. To my additional surprise, this helps make Boom a fairly involving little underdog story. At no point does it threaten to do anything revolutionary or even especially creative, but it sets up its potentially trite tale in a way that allows us to embrace it. I suspect James’ presence helps. He tones down the comedic shtick and embraces the schlubby side of Scott enough to make us root for him. In a lot of ways, he should be an unlikable character, as he clearly just coasts through life and barely tries to teach his kids, but James finds a slightly deeper vein and turns the lead into someone about whom we grow to care. I also think James enjoys surprisingly good chemistry with Hayek. On paper, those two are a mismatch, but they interact in a way that makes their scenes hop to life. Usually the romantic segments of movies like this fizzle, but the scenes with Scott and Bella delight. Director Frank Coraci also keeps things breezy and entertaining as we move toward a predictable, inevitable – and absurd – finale. In some ways, the climax is the weak link; while we know the film will set up an ending in which Scott must win despite long odds, Boom takes such a contrived route to that scenario that it threatens to lose the viewer. However, it doesn’t; despite the ending’s ridiculousness, we still find ourselves invested in the characters and somewhat tense. Is the conclusion ever in doubt? Not really, but it’s a nervous ride to get there. Boom fails to become a concise movie with a clear through-line, as Coraci can’t resist unnecessary detours. In particular, we spend too much time with trainer Niko’s citizenship lessons; he’s a secondary character on whom the film devotes too much time. That issue notwithstanding, I still think Boom is a fun film. Nothing about it dazzles, and you’ve seen many, many movies in the same genre, but it still delivers likeable, rousing entertainment. Here Comes the Boom appears in an aspect ratio of approximately 1.85:1; the image has been enhanced for 16X9 televisions. The picture never excelled, but it was acceptable for SD-DVD. Sharpness was usually fine. Wider shots tended to be a bit soft, but those instances weren’t extreme, and much of the flick offered decent to good clarity. Shimmering and jaggies were minor – except for one shot at Niko’s studio - but I noticed some mild/moderate edge haloes through the film. Source flaws were non-existent, as I detected no specks, marks or other blemishes. The film’s palette usually opted for a light blue orientation or a mild amber tint. Within that design range, the colors seemed passable; they weren’t especially strong, but they were okay. Blacks tended to be somewhat inky, but shadows showed reasonable smoothness. Nothing here did much to impress, but this was an acceptable presentation. Don’t expect fireworks from the film’s Dolby Digital 5.1 soundtrack, as we got a mix heavy on music and general environmental material. When the track used the side or rear speakers, it was usually for MMA scenes, but even those weren’t especially involving; they opened up matters in a moderate way and that was it. For the most part, the soundscape stayed restrained. Audio quality was fine. Speech seemed natural and concise, and the score demonstrated pretty good vivacity. Effects did little to tax my system but they were clear and accurate enough. Overall, this ended up as a decent but unspectacular track. As we shift to extras, we open with a featurette called Here Comes the Cast. 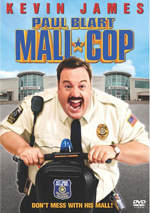 It goes for six minutes, 25 seconds and includes comments from producer Todd Garner, director Frank Coraci, and actors Kevin James, Bas Rutten, Henry Winkler, Charice and Salma Hayek. We get some notes about the actors, with an emphasis on happy talk. A few decent stories do emerge, but most of this resides in the promotional fluff vein. 18 Deleted Scenes occupy a total of 16 minutes, 36 seconds. Given how many separate sequernces get packed into less than 17 minutes, should you anticipate anything substantial? Nope, as the vast majority just throw in minor character tidbits. A few supporting roles – especially Niko – receive extra time, though, and we find a little more between Scott and Bella. The “Original Ending” just adds some comedy beats; it does nothing to alter the finale otherwise. Finally, we get a Gag Reel. It lasts two minutes, 27 seconds and shows the standard assortment of goofs and giggles. Don’t expect anything terribly interesting. The disc opens with ads for Playing for Keeps and Hotel Transylvania. These also pop up under Previews along with promos for Abel’s Field and Premium Rush. No trailer for Boom appears here. Contrived, trite and predictable, Here Comes the Boom should be a dud. However, via some generally peppy direction and a nice cast, the film delivers an engaging take on the underdog genre. The DVD presents average picture and audio as well as some minor supplements. This isn’t an impressive release, but I think the movie does its job.